way back then. Lots of long songs to chill to for this one because it was intended for late night radio. Here’s the playlist and here’s the original playlist (it’s gotten a little messed up since). Enjoy and if you do, please donate. First time listening. Must say i love this podcast. I am a huge Floyd fan myself and love hearing the old and/or rare stuff. I have a huge collection of different bootlegs. If you need anything, just let me know. Welcome aboard Scott! Thanks for the kind words. There’s plenty of floydpodcasts you’ll be sure to love. I do as well and had it posted as a podcast but Pink Floyd Management asked me to remove it. This reinforced the reminiscing, and got me all nostalgic. The Opening Bell sent me way back too – not since ’87 have I played “New Floyd” more than “Old” – young again! And now going back through all your back catalogue of podcast gems – currently on http://floydpodcast.com/glancing-up-through-the-rain/, so good. Cheers, and hearty thanks, from this side of the water. + while we’re on the covers, only two I can’t work are the very top and very bottom, please someone work out what they are, I won’t sleep til I know. And the top must be Saucer, worked out “SECRETS” in the end. Sleep at last. 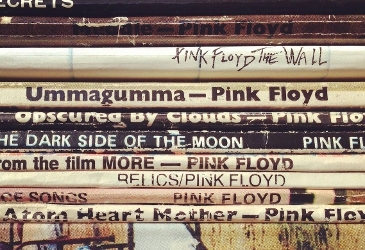 Then time for next floydpodcast?… here’s hoping. Ace photo Doc, is that your vinyl stack? If so what’s between Relics and AHM? Don’t recognize that title fragment. Thanks! Its not my stack. Not sure what the album is. if anyone recognizes it… please chime in. Looks like “Great Collection of Dance Songs”, just out if order. In the middle of the show now, loving it. Thanks Doc! great work again, but it looks like the playlist is last month’s. Thank you for the kind words. The playlist appears to be correct. You might want to clear out your temp files and or refresh the page.